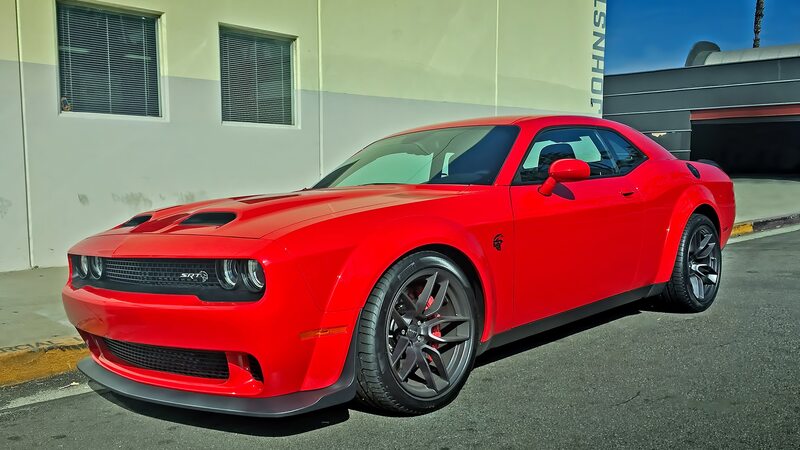 Here’s all you need to know about the 2019 Challenger SRT Hellcat Redeye: It makes 800 horsepower. Let that sink in for a moment—800 freaking mindblowing, earth-tilting horsepower! 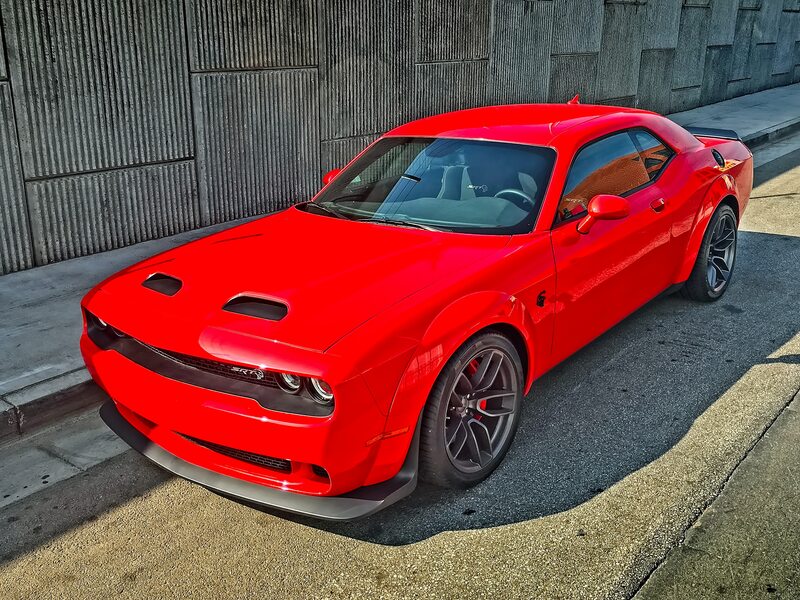 And this is no limited-edition Dodge Demon. The Redeye is a regular-production vehicle available in dealerships nationwide to anyone who wants 800 mess-your-pants horsepower under their right foot. Well, okay. That’s fake news a little. 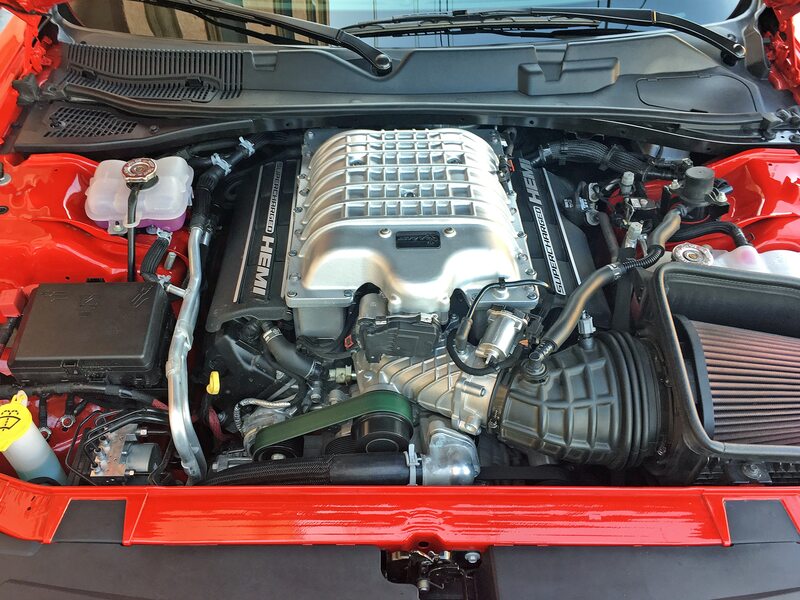 Officially, the supercharged 6.2-liter Hemi V-8 in the new Redeye delivers 797 horsepower at 7,500 rpm. But c’mon. That’s 800 horses to anyone but a Debbie Downer having a bad hair day. As such, a little perspective is in order. See, the new Ford Mustang Shelby GT350R makes a “mere” 526 horsepower. 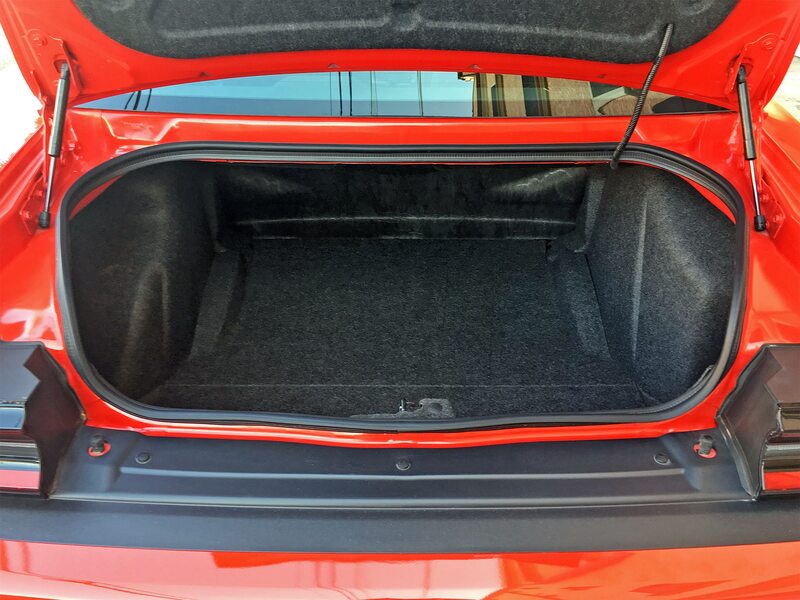 The vaunted Chevy Camaro ZL1 can claim “only” 650. Even the awesome, $517,000+ Lamborghini Aventador SVJ comes up short at 759 horses. Call it what you will—797, 800, or “uh oh, I need to use the bathroom”—the Redeye is a “Jurassic Park” Tyrannosaurus masquerading as an automobile. Mind the snapping jaws, please. It’s not every morning—actually it’s never—that an 800-hp test car shows up on my doorstep. So I waited about, oh, 1.5 seconds before jumping behind the wheel and heading out onto the road. 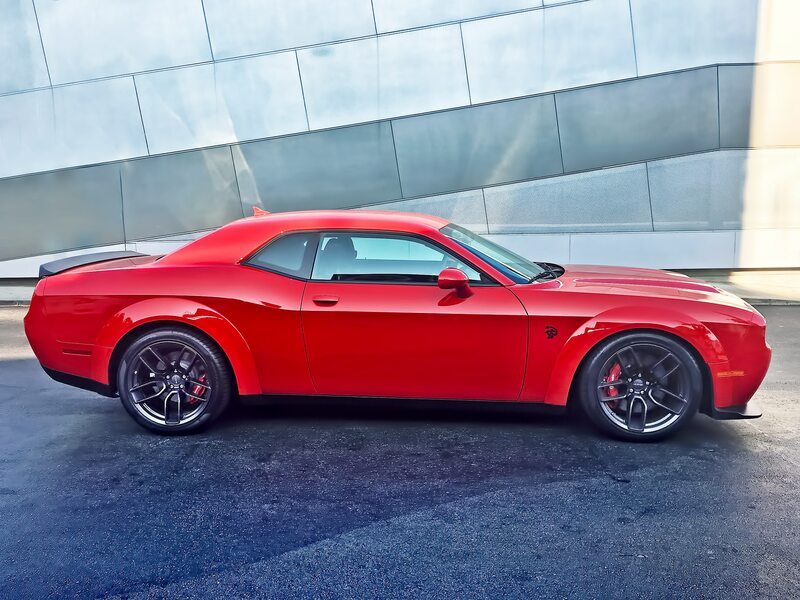 First impression: Holeee mother of Hemi! Even my first half-throttle blip sent the rear end skipping and skittering, and the traction control was on—I actually checked. 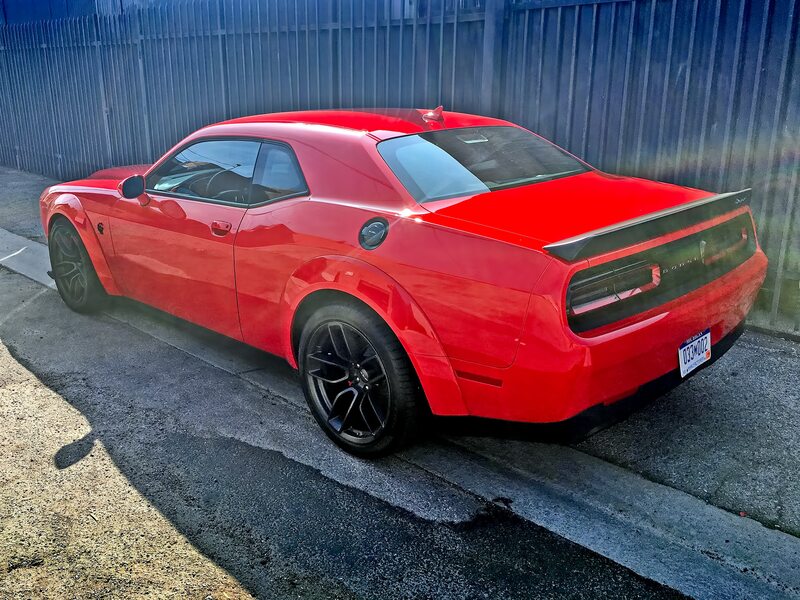 That’s what 707 lb-ft of torque will do, even when your rear tires are 305/35ZR-20 meats on 11-inch-wide, forged-alloy rims (my test car had the optional $6,000 Widebody package, which adds fender flares and 3.5 inches of overall width to the Challenger’s already broad shoulders). Yes, I spent some time gunning the Redeye down a few twisty roads on the outskirts of L.A., and it performed ably enough. But let’s get real, this Challenger isn’t bred for dancing. It’s a straight-ahead horizon-eater—and, man, does it ever feast. There is no point at which the Redeye is ever caught flat-footed. In first gear or eighth, a light dab of the throttle is all that’s needed to summon an instantaneous surge. Using the SRT touchscreen, it’s easy to activate the paddle shifters behind the wheel, and I used them most of the time I had the car. They work well, although the Redeye accelerates so fiercely in its lower gears I actually had a hard time upshifting fast enough. Seriously, the tach needle spins up as if it’s connected to a sewing machine, not a 6.2-liter hulk of iron and aluminum with 16 pushrod-activated valves. Downshifts, unfortunately, are nowhere near as entertaining. The transmission is reluctant to head back down the cogs, and when it finally does there’s none of the audible throttle blip or “zing” you’ll find in better automatics or almost all dual-clutch ’boxes. Then again, downshifts are mostly unnecessary here. You can plant your foot in eighth gear and the Redeye will still dust off most any other automobile you’d ever encounter. And the sound! 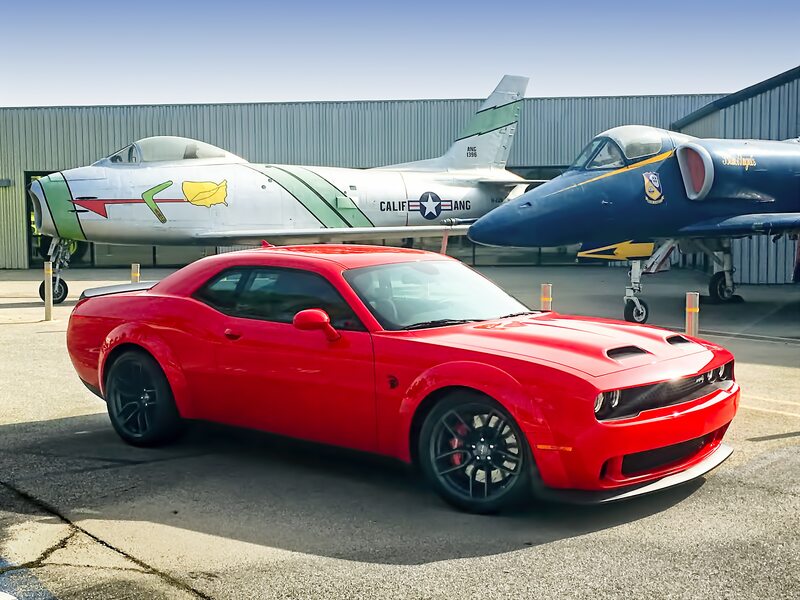 The supercharger emits a high-pitched wail that climbs with revs, while the Hemi itself is liquid-smooth yet as loud as an overflying formation of F-18s. Nearby pedestrians duck for cover when it rolls by. And then they see it and . . . they run. 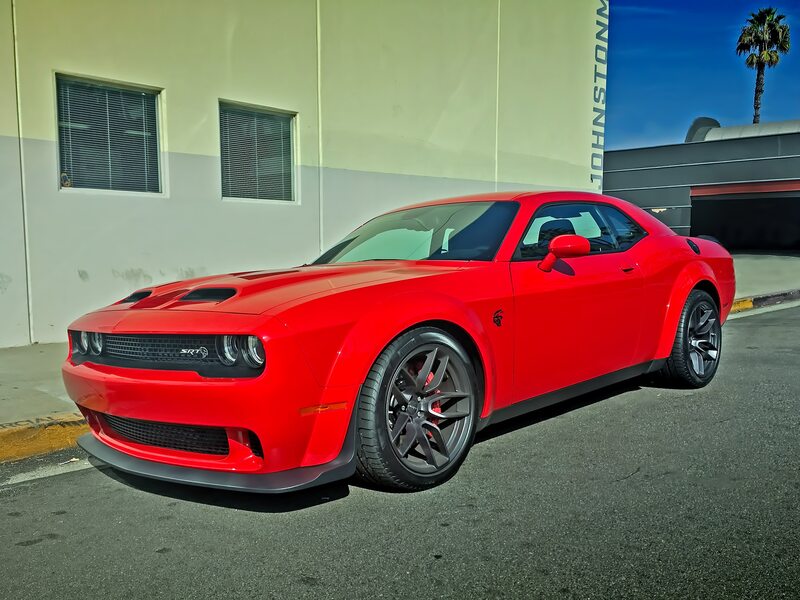 This mega Challenger—mine was painted in blazing TorRed with black “Devil’s Rim” wheels—looks every bit as menacing as it really is. The Dodge infotainment interface is top-notch. The touchscreen is snappy, responsive, and smartly configured. 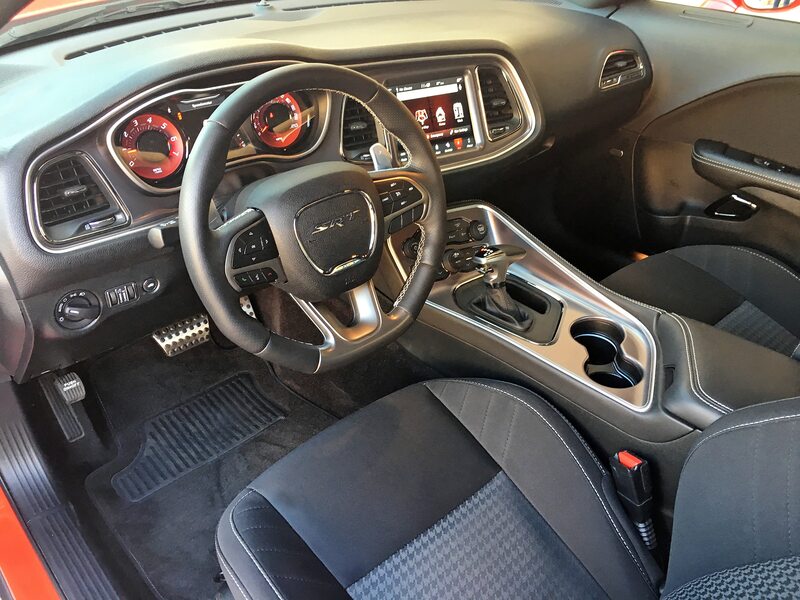 As noted, there’s an SRT button on the center console that summons a special screen that allows you to configure everything from steering effort to transmission responsiveness and suspension stiffness. There’s also a “Power” tab that, if pressed, instantly drops 300 horsepower from the Hemi’s output. I tried it once and immediately hated the result. Why? Because by then I was already a spoiled little power-addled brat. 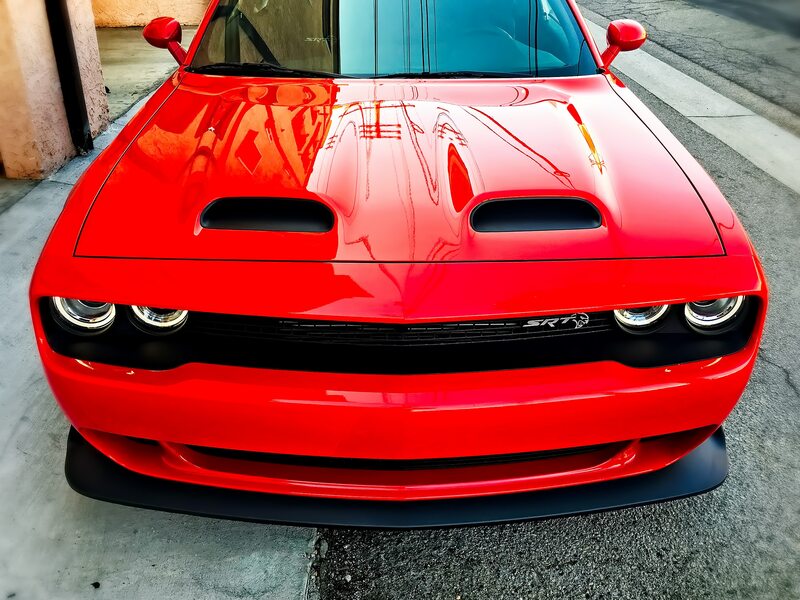 “Just 500 horsepower? How am I supposed to live with that?” Gimme back my 800 horsepower. Now!” I pushed the power tab and instantly my Redeye was once again King of All It Surveys. The Redeye may be available to anyone but it’s not buyable by all. The base price is north of $61K, and my test example—including the Widebody package and other options such as the Customer Preferred package ($11,000) and a 3.09:1 rear axle ($1,095)—tipped the sticker scales at $81,331, including $1,700 in guzzler tax. 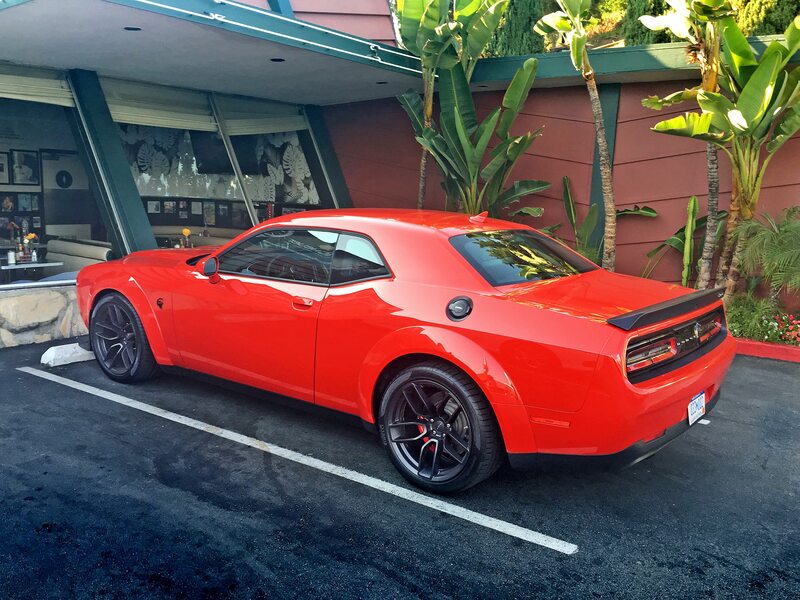 Then again, there is nothing else on the road remotely like the Challenger Hellcat Redeye. This is an old-school muscle machine in character, yet it’s thoroughly modern in manners and safety while at the same time delivering a punch the big bruisers of yore could only dream about. A quarter-mile of 10.8 seconds at 131 mph? A top end of 203 mph? That would’ve been the stuff of production-car fantasies in the muscled-up 1970s. But the Redeye can easily do both—and happily plod along in traffic on the way to the grocery store. Just don’t try to make sense of it. The Redeye is beyond “sensible.” Actually, it’s completely and utterly insane. And if that’s not reason enough to love it, well, maybe what you should be driving is one of those new-fangled electric scooters while also enjoying a healthful arugula and kale sandwich.